James rushed for over a thousand yards twice in college, including 1416 yards and 17 touchdowns as a junior in 1998. 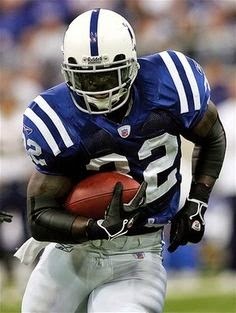 He declared for the NFL draft and was chosen in the first round (fourth overall) by the Colts, who were looking to replace the Marshall Faulk, who had been traded to the Rams, and felt that, with his receiving ability out of the backfield, he was a better fit for their offense than Heisman Trophy-winner Ricky Williams. Colts went 13-3 (following two straight 3-13 records) to finish first in the AFC East while leading the conference in total yards (5726), passing yards (4066), and scoring (423 points). Lost AFC Divisional playoff to Tennessee Titans (19-16). “The Edge” had another Pro Bowl season in 2000 as he again led the NFL in rushing (1709 yards) and also in yards from scrimmage (2303), scoring a total of 18 touchdowns. However, a knee injury finished him for the year six games into the 2001 season and, while he came back in ’02, was hindered by ankle and rib problems. While having lost some of his earlier explosiveness, he came back to rush for 1259 yards in 2003 and returned to the Pro Bowl in ’04 after running for 1548 yards and going over two thousand yards from scrimmage for the third time with 2031. After rushing for 1506 yards and 13 TDs in 2005, achieving one last Pro Bowl selection, he moved on to the Arizona Cardinals as a free agent. James was over a thousand yards in each of his first two years with the Cards, although with a declining average gain per carry and less production as a receiver out of the backfield. In clear decline by 2008, although he performed well in Arizona’s postseason run, he was let go afterward and finished his career with Seattle in 2009. Overall, James was chosen to the Pro Bowl four times as he rushed for 12,246 yards (9226 with the Colts) and gained a total of 15,610 yards from scrimmage as he added 3364 yards on 433 pass receptions. He scored a total of 91 TDs.